Stan's column for the month is up! It's different this month, but I think you'll really enjoy it! 'Tis the season to be jolly, falalalalalallaaaaa la la la la! And it 'tis! It's December! Happy December to all! Can you believe it? What happened to summer? Where'd it go? And so, yesterday Bill took me over to the storage place and we sorted through our Christmas things, and now I have my hands full! It's time to decorate and I'm going to go all out this year! I missed it two years ago due to illness, last year was hectic and difficult because I was still recovering. This year, LOOK OUT! I may be blind, but I've still got the "Ho! Ho! Ho!" in me! O.K., ladies and gents, we REALLY need your help for the Christmas party! We need YOU to sit in the greeters seats at Pietros, Wednesday night, (December 6th at 5, 6, or 7 P.M.) for our Christmas Party! You will forever be blessed! Please, let me know! We really need your help! You know... I keep thinking about this. Are you feeling down this Holiday Season? Are you feeling like you didn't get to fish as much as you like? Did the floods of 2006 get you down? Or-- are you tempted by commercials in magazines or on television of some wonder pill that promises to make you feel better, thinner, more energetic? Do you feel that if only you had more money, life would be better? Are you frustrated by your personal love relationships, or lack, thereof? Are you frightened by some recent health event in your life? Are you frustrated with your life, and have been recently tempted to fight and argue on the ifish board? Well... listen up! I think I've found something that will help you... and it's nearly free! We have all witnessed some of our nation's wealthiest people, searching high and low, for joy. Some of these folks browse travel brochures, searching for their dream vacation. Thinking they've found it, and in desperation they mutter, "surely this will make me happy!" They might book the trip, plan for days, and take the trip, only to arrive home back at their executive workplace exhausted and spent. Where are the smiles? Where is their inside lasting feeling of pure joy? Why did the excitement leave them, so fast? People with very little money might save for months to be able to enjoy two hours of being pampered at an expensive restaurant for an extravagant meal, out. Yet, the joy the meal brought loses it's 'feel good' in just a few days or weeks! It seems to me that as a society, we run around crazy searching high and low for joy and happiness!? We think that we'll find joy if only we fall in love with the right person, or if only we could win the lottery, or if only we had a better job! Nights unrested, tossing and turning, wishing for the perfect boat, the missed fish, the lost opportunities! Where is the joy? Will it come on Christmas when someone brings you the perfect gift? You know, people thank me for putting this event on. Gushing, they say, "Oh, Jennie! You do the most wonderful things! What a blessed event you put on! You should be so proud! You are so selfless!" Well, I have to tell you something. I must be fooling you, because It isn't what you think. I have to be honest, here. I'm not all that great! In fact, I'm down right selfish! Absolutely and positively self centered!! I found joy, and I'm going to tell you how! I give to the children at Emanuel Hospital! The first time ifish did this event, I knew we were onto something big! The joy it brought me lasted all year long and more! It's something you can't put into a jar of pills! It's something that no travel brochure can offer you! By giving, you will feel good, too! I promise! And it's not that fleeting rush of "feel good" but an honest and everlasting feeling of peace and pure joy! The kind that makes you wake up day after day with a smile on your face! Ever seen that look of joy and peace on someone's face? Want that? I sure do! I have found that after the Christmas party, I leave feeling better than any girl has a right to! Anything that makes someone feel that good, has got to be the right thing! And, it's free!!! All night and for many days and nights after, I'm smiling with pure joy! Fellow ifishers are giddy, counting them, and laughing as they fill the freight truck that is headed to Emanuel Hospital with toys! Toys! Toys! These toys will be presented to children that are ill, and have to be in the hospital at Christmas Time. A time when all families should be home, together, celebrating. These kids have got to wonder if Santa will ever find them in that big unfamiliar building. Imagine when they wake up and find that Santa DID find them, after all! The very thought of it brings tears to my eyes. You know, it's not everything to these kids. The presents won't cure their ills, but it's got to help! Anything will help! They have so much to worry about and that's just not fair! But, it is what it is, and whatever I can do to help, I've got to do. I almost feel like the scale tips further for my joy by giving, than their 'joy scale' does, by receiving. If I could tip it their way, I would, but this is all we are capable of. Many, many people don't realize the joy that they are missing out on, for free! I mean, people with alot of money miss out! They really do! And this is a joy that people without very much money can get in on! Everyone deserves to feel this good, and God above gives this gift to every one of us, equally! It's the ability to give to others. The rich and the poor, everyone can give, no matter how much or how little. What you get back is huge. All we have to do, is to take Him up on the offer! Grab it! The gift you receive from giving is available to all of us! In addition to giving to the kids, I am filled with laughter and pure joy as I hand out the much deserved presents to the moderators. These small tokens are for the selfless work they perform all year long on ifish, for free! They help ifish FOR FREE! How lucky can a girl be? Ladies and Gentlemen... give yourself a gift, this Christmas! Come to Pietro's at 5:00 PM on Wednesday, December 6th. Bring a toy for the children at Emanuel Hospital. Enjoy the company of others who will also find the joy of giving, that night. We'll all have smiles and happiness in addition to the most wonderful pizza you've ever tasted! This dinner out will bring you joy that will last longer than any expensive, extravagantly prepared meal that I know of! And so, when you are standing in line, waiting to order at Pietro's this Wednesday night, look around! See all the joy that is on everyone's face that has a present, in hand? "I want whatever they are having!" 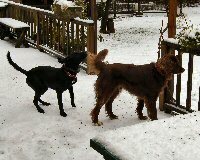 Kilchis and Rev in the snow! I'm feeling like I don't know anything about fishing, anymore. I've never had such a fishless year! Not since I was a pre teen! 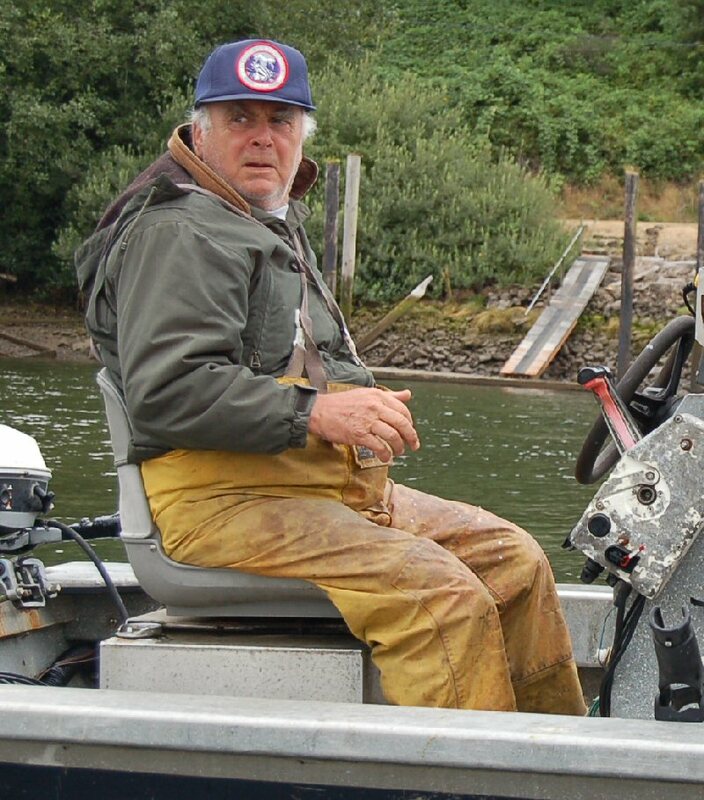 And today, I have an opportunity to fish, and Bill and I are just sort of sluggish about it. Why aren't we fishing? We could be! Regarding fishing, what a challenge! I am afraid to back the trailer without my eyesight, so that limits things. I think I could, but you know, I was always so proud of my backing skills, and now that I can't see and things are so busy at the ramps, I'm so afraid of making a doof of myself! I can't lift the anchor anymore, so there again, it leaves us a little helpless. Bill just can't do it all. The river has been so high, that we'd need the 40 pound anchor. That's just too much on me, even with the help and buoyancy of the water. It's one of those things where I need a push. "Just go, Jennie! Just do it!" I have been a little naughty, though, and have had to learn that no, I can't lift the groceries. I can't vacuum, nor move the furniture. I just have to say no! And now, surgery is off till January. Plus, they can't even guarantee that it will work. It's risky, and it's uncertain. Oh, how I miss my eyesight! Especially when I sit down to type and I fall off the home row. I can type, blind, but if I miss the right hand position, I can type for a long time, only to have Bill say, "What are you doing?" Oh no! I say, with a crinkled nose up against the screen! It looks like this! )oy ;ppld ;olr [email protected] LOL. I can do some things, however, and I feel blessed by them. I have decorated the house to look very Christmas like! With my vision, the soft, blurred glow of lights are beautiful! It's a very soft world that I live in... and the lights lit up are very festive, and peaceful! But, last Saturday night, I was lying in bed shivering with a fever of 102, when my phone rang. I was speechless and in tears when I hung up. I picked up the phone again, and called my Dad. He heard my tears, and said, "What's wrong, now, henny?" He's so used to hearing bad news this year, that he was probably gripping for more. "Dad? I was supposed to go to the NSIA banquet tonight, but I caught Andrew's cold, and I'm sick. Liz just called me and Jim Martin, this really neat guy that I admire, was talking to the crowd, there. Dad? He was talking about me! They gave me an award! They said all kinds of nice things about me! It made me cry! They awarded me the Buzz Ramsey Foot Soldier award, while I was on the phone! My Dad laughed in relief and pride. "That doesn't surprise me, henny..." He chuckled. I was so proud! In a way, I was glad not to have been there. I would have just died if they'd have done that while I was there! I would have hidden under the table, I think! NO WAY could I have sustained any sort of composure being noticed like that! So, the way it happened, if it was to be, was good! I was able to cry and be proud all by myself, under the covers! My Dad was proud of me, too! But, Jim? Thank you so much for your kind words! They were a bit exaggerated, but I thank you for your kindness! For your support! It means so much to me! And so, as usual in life, there is a balance. I have so much to be thankful for, and I'll just keep plugging on. One thing, there is nothing dull in my life! That's for certain! I am thrilled with the Christmas party Wednesday night and I can't wait! I am excited about the Kwikfish contest. Besides fishing, there is so much going on! I am delighted with the soft Holiday lights and festive greenery that I've surrounded myself and my family, with. Last night, as I slid open my window, I stared out at the glistening meadow. Tiny blades of grass, each tipped with ice crystals. The full moon shown brilliantly in the black/blue sky, big enough for even me to see! Long shadows of trees stretched across the expanse. What a beautiful background to thank my Heavenly Father for every experience that I have been lucky enough to have in my life. Everything! Good and bad, that has shaped who and what I am, today. My children are fully grown, and have come to be my friends and my helpers. My pets, who lay snuggled in their beds, waiting for me to come lay beside them and cuddle up. A river, that sings it's song, waiting for me to rise in the morning. The river that gives me endless hope that I might someday, actually catch something! But most of all, I find myself eager to celebrate Christmas, the birthday of my Savior, and all that it represents to me. Joy, Peace, and a fresh start for everyone in life, over and over! I think that with each passing year, I understand more and more deeply what the true meaning of feeling the Holiday Spirit, is all about! I call the surgeon AND I went fishing! Fishing was so awesome. Well, I didn't really fish, because the water is low, but I had a blast watching the spawning salmon! It's really neat how when earlier in the season, people are on the hunt, and the salmon play along. They spook, at every little movement, and are very hunt-able creatures. Later, when they have spawning on their minds, they stay right out in the shallow opens, and let you watch them. Sometimes, they won't move for anything. They are so engrossed in their mission to spawn. I sat and watched for almost an hour as a small white colored female was teased and tortured by two bucks. The dance they performed was awesome. The flash of her sides as she dug her redds were bright and silvery, no matter her poor color. It was totally mesmerizing, and I thought to myself. "This is a gift. A gift for calling my surgeon. A gift for being brave enough to take that next step." I have a feeling that God isn't nearly done with me, yet. Man, I'm sick. I've really got the coastal crud, this time. I haven't been out of bed, all day, and yep... I'm going back there! Just had this flash that the Christmas Party was still advertised up top, so I thought I'd make that change. I hope I don't have the flu. I can't ever recall feeling this bad. Did a truck run over me? Oh, thank GOODNESS I feel alive, today! My gosh! I felt literally like a truck ran me over, yesterday! I still have a cold, but I can live with that! I wanted to introduce a very patient man. Dee's Diamond Flashers has been on ifish's wait list for so long, and now he's finally on ifish! I'm so excited to introduce him and his product to you! I really like the product, and I really like the man, behind them! If you'd like to take a look at the online inventory for Christmas, look no further! Click here! Read the Flasher Frequently Asked Questions, too! I learned a thing or two! Anyhow, welcome him to ifish! He's going to do a really cool contest on ifish, soon and when he does, I'll link it, here! I love to stare at the trees tops in the winter during a storm. The soft green and fuzzy giants hover over me and their wispy top feathers stand out against a creamy gray sky. Trees, some of them hundreds of years old, sway in the wild winter winds. Sometimes, I sway with them. To regain my balance, I look down at my feet. Surrounding them, a blur of muddy water slaps at my boots. I'm surprised to see a salmon, freshly dead, laying two feet from me, but a little deeper in the river. I swear it hadn't been there when I stopped to rest here, just a moment ago. It tips back and forth in the waves of the rising river. One shove would send it downstream. I left it be. All in it's own time. I stood still for a few minutes, taking it all in. I breath in, deeply. The current seemed to actually rise, as I exhale. Trying to shake loose every bit of the stress of the day, I search all around me. I was tired of trying to "see" sharp words typed out on a computer monitor. Tired of people problems. Tired of medical appointments. Just tired. This is where I come to replace my stress with calm. If there is anywhere in the world that I can erase the stress of any day, it is found, here. I just send it downstream. I get lost in the blur around me. I love the Kilchis river, viewed through my softer vision. I scan upward from my boots. My eyes pause for a moment as racing white foamy water grabs my attention. This is where the current of the river makes a sharp right angle. I'm always amazed at it's fury. The brown and green brambles dance in the water's edge as they are pulled by the fury of white water. The bottom of the river, here, is scoured out, deeply. The strong current tumbles rocks, and moves huge boulders dug into the earth as if they were as light as air. The river tries madly to take all it can, down the river. "Follow me to the sea!" It screams! I giggled at those strong little branches, so used to this constant pull, as they hang tough. Stronger than the rocks, below, which often give way. Those skinny little wiry branches wave them adieu! I know about the rivers strength. Even with my vision, I have seen hundred year old trees, roots and all, float down this river, taken by this same force. I, myself, have felt the pull of the water against my bones, as I try to steady myself, when wading against the current. It's a force to be reckoned with! And yet, with my vision right now, it seems a soft and gentle toothless monster. I want to be those strong little branches... but not today. Today, I want to be swept away, gently, to a nice place. I tilt my head back more, and gaze upward. My eyes follow the network of the forest, dark green and brown. With wispy branches, they softly wave in the wind. Bucking against storm force winds, their grace amazes me. A watery color of delicate green tree tops, painted with their brushes, a soft gray and white wash. I could barely make out the giant cumulous clouds that raced across the expanse of sky. Sometimes I'm thankful for my softer vision. Sometimes I actually like it. Shall I keep it this way? Shall I cancel my surgery, and live in this soft world? While my lack of focus is frustrating at times, the world is really a rather sharp place. Add a little blur, and I relax a bit. It rounds off those pointy corners we all get bruised by bumping into. With this current softness, I find myself wanting to wear my pajamas longer in the morning. I am tempted to lay longer, wrapped in my soft robe on my feather bed. I throw open the windows and just breathe and listen. The cool air takes over. I hear the river's winter song. The fury of life's storms whistles through the trees, and right by me. Back on the river, I began to sway again, dizzy from staring into the sky. To regain my balance, I take in a deep breath and bring my eyes back down to my feet. I was just in time to see the salmon that had been waving in the water, set loose by the rising current, and head downstream. As it gained momentum I imagined it carrying all of my stress with it. Down the river I followed, as I tripped over the rocky river beach. The dead salmon entered the whipping current and fury of the river's bend. The thirty pound fish was pushed nose upward into the riffles as if it were a pop can, and then tossed and turned, up and down, through the churning water. When it was finally spit loose, it gently fell, twirling, to the watery depths.. deep, deep until it was at rest, on the bottom of the river. I walked back to the house, feeling new. Kilchis and I stopped at the laundry room as I rubbed him dry of the rain that had fallen on us. I walked past the computer, as it hummed along, ignoring the "you have mail" flashing icon... and instead opened up the wood stove and tossed a log on the fire. The aroma of garlic heavy spaghetti sauce that had been simmering all day, filled the room. I left my calendar on the kitchen table, as my appointment date for surgery tried to grab my attention. December 28th, it screamed at me. I was able to leave it be. The telephone rang, but I didn't pick it up. The constant ring didn't even phase me. Instead, I tackled the steps up to my bedroom, and walked directly to the bath tub. This is yet another place of serenity and calm. I turned on the faucet, poured an extra helping of bubbles into the warm stream of water, and began to get undressed. The river does this to me... it brings calm. -and with my softer vision, I climbed into an extra warm tub. Just like that salmon, I was finally spit loose from the stresses of the day. I gently fell, twirling, to the watery depths... deep, deep until I was at peace. I wanted to thank Bullet Freight, David Logsdon and Gary Cheney for their help at the Christmas for Kids party, December 6th, at Pietros. Due to these fine people, we had a successful event, again! Please click here for a few of our expressions of how much we appreciate you! The barometer is falling like a rock and everyone is just a bit antsy around here. Something about the barometer dropping makes all my joints ache like I was 90! I keep an eye on things, here. Scroll down on the right, and read the "forecast discussion". It is so interesting to hear the forecast, coming from them. Sometimes they are free to leave in little comments that really make me laugh. Once, it was "Oops! We goofed on that one." :) I love it, when techno people get real. I wanted to take a minute to thank Freespool for all he does on ifish and on other fishing web sites. Do you know that when Liz explained to me just what the Foot Soldier Award was, that the first things out of my mouth was, "Liz! You know who should get that!!! FREESPOOL!" She agreed that he does a wonderful job and that he deserves the award, also. I'd so like to see him called up to receive an award like that! "It is not the critic who counts, nor the man who points out where the strong man stumbled, or where a doer of deeds could have done them better. The credit belongs to the man in the arena whose face is marred by dust and sweat and blood, who strives valiantly, who errs, and who comes up short again and again, who knows the great enthusiasms, the great devotions, and spends himself in a worthy cause. The man who at best knows the triumph of high achievement and who at worst, if he fails, fails while daring greatly, so that his place will never be with those cold timid souls who never knew victory or defeat." Oh... Jim! I like that one! Jim was also the man, who introduced me to the quote on the right, below. You know, the "Do not burn yourself out" one. These are both worthy of remembering. Anyhow, have a great day, and please be careful out there! Mother Nature is about to unleash her fury! I'm back! I'm back! What a wonderful relief to wake up to the power on! Yay! I actually like the slower life. I enjoyed it. Andrew read by candlelight by the fire. We laughed. We ate by candle light, together, at the table. We laughed, talked, enjoyed one another's company. Bill didn't seem too keen on it all, but I really enjoyed it! Bill missed his television. His "Law and Order". I did not! I cried when I saw the trees fallen, across the river. It looks like dominoes, all mowed over, and dipping into the flooded Kilchis. So sad. Years of growth are just trampled over, like some evil monster had been through there. People sure won't be bank fishing across the river, at that location. It's a mess! I wonder how that will change the flow of the river. Everything seems to. Even the slightest change of the bank can alter the flow, dramatically. Look at our gust of 89! That was a real trip. It was sustained long enough for us to catch it, on the battery powered Davis Station. Click here to see. I kept the local radio station on. I giggled, listening to the Dairy updates, and all the fun games they play here, locally. Reminded me of the community of ifish, a bit. The first night, listening to the radio, Bill said, "Oh! Don't tell me we have to listen to an hour of Christmas Carols until the next update! I smiled. I listened to Christmas carols the entire next day, and thoroughly enjoyed every one of them. I'm still humming along. I needed that fix of Christmas and now they are in my head to stay. Look out, family! It's Jennie, humming the 55th verse of "Deck the Halls!"! It's nauseating for them, I'm sure, but I don't care. I like Christmas Carols, and I think, just for fun, I'll turn on the radio, again, today! I'm thankful for the glass of water I poured from the faucet, and the heat, blowing from the floor boards. I'm thankful for the cup of coffee I have, hot from the maker, and most of all.... for Christmas Carols, and the Holiday Season! Merry Christmas, one and all! We have power! And... what is it I hear Bill singing in the background? The 55th rerun of "Deck the Halls with... Law and Order? Fa la la la laaaaaaaaa la la la la?" Oh, cute, Bill! Turn up the radio! My Christmas lights are so gorgeous against the white, twinkling ice! I love it! I just turned them on. This has been a difficult shopping Christmas, due to my lack of eyesight. I'm feeling dependent on others. I can't drive. Well, the doctor says I can, but I don't feel as comfortable as I'd like. The river is perfect, this morning, but oh! So cold! 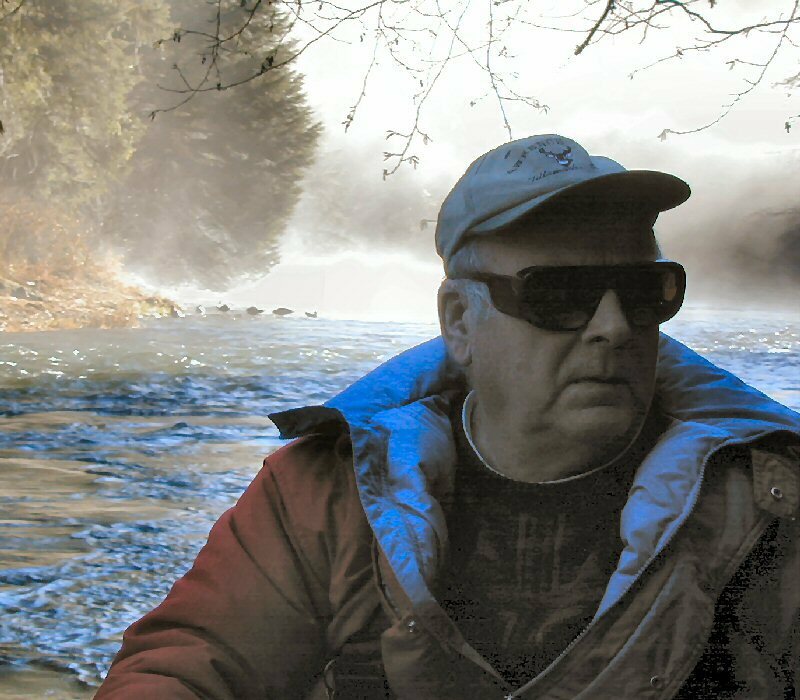 I think I will bundle up and do my first steelhead fishing, today. I absolutely adore the first day that I have my favorite rod and reel in hand. That cold, beautiful reel and my long, beautiful steelhead rod! All polished and cleaned, and ready to use! Each year as I take it down from the rack, it's a special day. Plus, drift fishing, I can fish by feel! I'm kind of nervous about the flood, and how it's changed the oh so familiar structure of the river. I'll have to explore it by feel, all new, today! Some parts, I'm sure will feel like an old friend. Others? Oh, my, but everything is rearranged! I think Rev has salmon poisoning. Regardless, she is ill. I may have my differences with that beautiful black lab, but when a dog is ill, it takes my heart. I've been fussing over her all night. She's in pain, and not at all feeling well. Poor, pitiful whimpers and sighs escape from her. I've been close by her side, since we noticed, last night. Bill will take her to the vet, this morning. 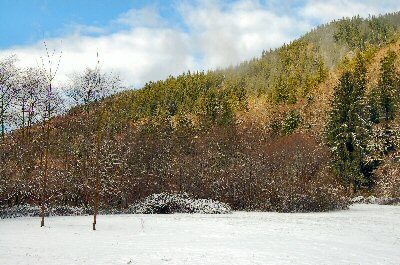 Well, off I go... past the land of snowy white, glistening lights, and out to the river. All around me, it just shouts Holiday! Christmas cold in the sky, ice on the lawn and rocks, and after I'm done fishing, a colorful Christmas lit up house will call me, complete with a fire in the wood stove, and hot tea on the stove. Life is good. Oh so good! Even with my recent challenges that sometimes make me feel like giving up... I'm always reminded of how wonderful life really is. There are always things that make me smile, take a deep icy breath, and keep on keepin' on. Sometimes, and mostly late at night, I lose all hope, and think that this recent loss of eyesight is my last straw... that now, feeling totally dependent on others, I must give up. Tears well up in my eyes, and I think the end has come. I begin to feel overwhelmed by lists of things, undone. I have to giggle at myself, though. A good long winter's nap, and a morning that greets me with snowy windows, a chill to the wood floor, and a warm piping fire renews my spirit and calls me to thankfulness, time after time. You'd think I'd learn. Ya just gotta have faith. So, I get out my list, cross off one more thing, and head out to the river. Will I catch something? I don't know! But sure as heck, as I look around at all that I have been blessed with, I take note. The vision I have left scans the river that cuts green through the snowy rocks. The keen, cold feel of my reel in my hand, the line, bumping along the familiar rocks, and finally, the tracks of my shoes, leaves a visable trail of return to the house. As I open the door, the warmth hits me like a blast in the face. God has blessed me and mine, and I am truly thankful. Today is reserved for baking goodies and fishing. Do you know that it's been months since I've hooked a fish? But, that's alright with me. Really, it is! I've been so busy, lately. Not only that, but the challenge of living without eyesight has been enormous. It really takes more time to live like this. I have a contact in one eye and 6 pairs of glasses that I have to have in my pocket, in order to get around. What a hassle that is! And if I leave any of them, anywhere, I have to go find them. Without the glasses to find them, well? It's frustrating and I get alot of exercise! I cried and cried, when I watched the 2006 video of the Christmas Party. Oh, watch it! What a wonderful group of people! This is my family! Linda did a wonderful job putting it together. The music matches perfectly, and the photography is excellent! So many of my friends! Thumper looks wonderful! My Dad... the pictures just touch my heart so deeply! Hugs to all the ifish mods! The children are so beautiful! Friends that I have yet to get to know! Truly... ifish is my family, indeed. The other night I was so proud to go to David's Winter Concert at the high school. As the music progressed, they kept introducing solos; "God Rest Ye Merry Gentlemen" with a solo by David Martin and Kyle". And the next one, "With a solo by David Martin". And another one, "With a solo by David Martin." That's my son! I wanted to cry out, in the audience! That's my son, again! He really is very good, and they were having so much fun. During the concert, I got to thinking that this night was to be my last School Christmas program. David will graduate this year, and I can't get any of this time back again! Where oh where have my babies gone? I'm trying! I really wish I'd spent more time playing music with David. I used to volunteer at the schools daily. I guess I stopped when my health became more of a challenge, but still, I regret not being there so much. I think kids actually need their parents involvement more in their older years, rather than their younger years. They seem independent of you, but actually, this is the time that although they may not welcome it, your involvement is very vital. I only hope that there are more chances, in the future. It gives me hope to think that perhaps I can be involved in his college music years. I can live afresh! Oh! By the way, yesterday was David's court date, and we were so joyful when we walked up to the cashiere's window at the courthouse. The gal asked for David's license. She handed it back, checked something off and said, "You are excused!" That was it! No fine for the previous ticket for driving without a license! Yay! What a relief for all! You know, in the recent past, instead of being so involved in the high school, I became deeply involved in the ifish family. I made so many close friends that ifish truly is family to me. If I can watch a video of a room filled with smiling faces bringing toys for children and it causes tears to flow, certainly they must be my family! So, in fact, I've gained and grown my family to be part community, part blood relative! My family is so large! What a wonderful thing! When I'm ill, I have so many to care for me, and when I'm well, I have so many to care for! That is truly a gift this Christmas season! So, this day is dedicated to two things. Cooking, and fishing. I'm fishing, to clear my mind. I'm cooking for my family. Like I said, I haven't been catching. Somehow the walks on the river and exploring the structure of the river with a rod, line and weight, I search for something, and it's not always fish. It reminds me of another saying by Thoreau that I've always repeated to myself, as I discover wonderful thoughts and realizations in my mind, while out fishing. This is why I don't care if I actually catch a fish, this morning. I never leave the river bank and come back to the house without catching something. Mostly, I "catch" personal peace. I've settled many conflicts while repeatedly watching my bobber pass by me on the water. I've healed many hurts while sitting on a log, plunking. I've turned a tear into a smile while watching an eagle soar overhead. I've changed anger into laughter, while Kilchis digs a hole, beside me. I've turned regret into hope, as I repeat to myself, "Expect a fish, with every cast!" And I do! Even after a full salmon season without one! Now, that's personal endurance! Any frustration over that fact dissolves, with the hope of every new cast. I will work out the regret that I feel for not being more involved with David, on the Kilchis river. It can be as frustrating as trying to find my glasses without glasses, but it will happen! I will never smother those feelings, but instead, feel it deeply until it becomes a part of why I live, why I hope, and certainly, why I fish. By the way, my scheduled eye surgery is December 28th. I've yet to announce it, because I've yet to accept it, thoroughly. I printed out a picture of my surgeon, and I pray for him, daily. If you want to join me in this endeavor, here is his picture! If you decide to print it out and do the same, please let me know. I am conflicted, a bit, because of the uncertainty that both my surgeon and I hold, about whether it will be a success. I've yet to have a surgery like this one, where the results will be uncertain. I need to have more faith. I'm 'fishing' for more faith. I'm praying for a miracle, actually, and I'd appreciate it if you'd join me. I need to remember that I do believe in miracles because I believe in our Heavenly Father. We often hear that "seeing is believing". My Father in Heaven performs miracles daily. In this case, "believing is seeing." I don't need to see to believe. But who knows? With all those things to fish for, if I just happened to hook a fish, I'd be happy with that, too! With the aches and pains that come with a busy day, I leaned over slowly, my hair catching in the branches of the noble fir tree that we so carefully chose to be ours. "Right there, Mom! Look!" I couldn't see well, but David pointed at Molly. There was the vandal! There lay the contented culprit, her eyes dancing in the flashing Christmas lights. Oh, but she had a delightful time! She yawned, the damage done all around her. Christmas is for cats! Boxes that had been neatly wrapped for the special morning, now sported long, ripped shreds from cat claws. She lay under the tree, napping after her cat work, surrounded by Christmas cat-fetti. Oh what fun, tossing silky ribbons in the air! At the time, I was frustrate d. Sigh. I spent hours wrapping those presents! Not only did fear wash over me, with the thought of having the kids discover what was underneath those wrappings, but the thought of a redo was overwhelming at this time of night. I had just reached down to turn the lights off for the day, looking forward to a long, winter's nap. Certainly I was not up for more hours at the wrapping center! I must admit. Molly is entertaining. She does not lack character. 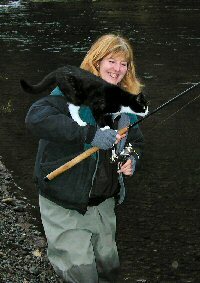 I have never owned a cat that will follow me down to the river. Not only that, but she fishes, and with glee! 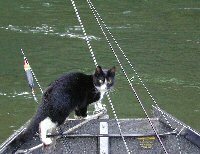 She loves the boat, and often times when I'm face to the river, much to my surprise, I'll feel a cat, jumping on my back, mid cast! Odd, you say. Yes, she is odd! But, you have to smile! Once, thinking surely that she would stay put, Bill and I launched the boat, beginning a day trip down the river. We anchored out back, preparing to fish, when she began howling, miserably. She wanted in the boat? Really? Bill and I shook our heads, and kept on with our work. "Bill!" I couldn't believe my eyes! "Bill! Molly is swimming out to us!" Sure enough, Molly was chest high in the swift water, headed out to join us! We quickly pulled anchor to rescue the poor thing. And yes, she joined us for the day. Molly loves a good boat ride! I don't know that I've ever heard of such a cat, but I'm glad to have a fishing buddy. My boys were my hope in life, and they grew up, somehow, without sharing my love for fishing. I guess I'll have to settle for a cat. Kilchis loves Molly with a passion, and I have to admit, Molly feels the same. Rev, our new black lab doesn't fit into the family in the same way, and doesn't understand Kilchis' ways, when it comes to cats. Rev wants to chase. It's interesting, though, that Kilchis actually protects Molly from Rev. When Rev goes after her, or even so much as stares at her in the wrong way, Kilchis will growl a protective growl and head Rev off. There will be no cat chasing in this household, as long as Kilchis has something to say about it! And when night falls, it is Molly that Kilchis chooses to snuggle up with. It's really a darling site, to find them snuggled up together, come nightfall. Yesterday, I shopped for the animals, making certain that each one of them has a stocking filled with their favorite surprises for Christmas Morning. Santa Claus doesn't forget the animals in the family-- especially if they've been good little fishing pets, this year. Visions of sugarplums, dance in their heads. And so, this morning as I surround myself with presents that need a little first aid, I have to smile. It is the character that Molly possesses that makes me smile as I repair each and every present that she couldn't wait until Christmas, to unwrap. I still love her... ever so dearly. At least the tree is still standing! Christmas was really nice. Totally fulfilling, with lots of glitter and lights, family, presents, joy, food, food, food and more food. It was, and continues to be everything I'd expect Christmas to be. You know, that doesn't happen every year! I feel fully satisfied and fully gratified by the the entire festivity! No more food though, please. I'm fully full, also! Oh, wait! I did miss one thing! I didn't get a fruit cake this year! I have to have one. I must! It has to have nuts, too. Pecans, to be exact. Put that on my list for New Years. --Must have fruit cake! They are so awful, and yet so wonderful, all at the same time! 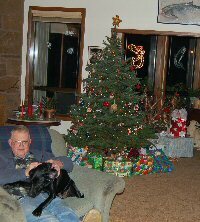 On Christmas Eve day, Pete came to visit and to exchange presents. We were naughty children, and opened them that day! We usually wait till Christmas morning, but what the heck! We couldn't help ourselves! It was almost more fun doing it that way because I get such a charge out of people opening gifts that I've selected for them. I care very much that people like what I get them, and Pete liked it! I also loved what he got me, so it was perfect! Pete is familiar with our tradition of searching for agates to leave on the drive, on the way up from the river bank. Lacking vision as I am, now, I would see a bright rock, and pick it up to hand it to him. "Does this one glitter? Does it sparkle?" That's what I'm after, these days. I'm spoiled by our river bank. Agates are everywhere and they are all pretty. I'm selective now, though, and absolutely adore anything that sparkles. Oh, how I miss being able to see sparkles! If there is one thing I can't wait to see if my surgery works, it is sparkles! The sparkles of a diamond, fake or real, the sparkles on a holiday ornament! There is nothing more fun than wearing sparkling diamond jewelry to a Blazer Game. The overhead lights in the Rose Garden make anything from cubic zirconia to real diamonds look absolutely fabulous! I don't watch the game. I just sit and marvel at all the sparkles! I was so glad that Pete was along on the river walk, and as I picked up one very small rock, I asked Pete, "Does it sparkle? It looks like the type that would sparkle." "Yes." He answered, upon examination. "It sparkles." I didn't believe him. I hadn't found a sparkling agate in ages. "No, Pete, really! Does it?" He looked again, and assured me that it did, but no matter how hard I studied it, I couldn't see them. I was disappointed. I carried it up to the house, and took it in our bathroom that has the best lighting. This is where I keep all of my sparkling agates on a special shelf, right under the light. Not one agate on this shelf is without sparkles. There aren't many of them, and out of thousands of agates found, here lay around 20 rocks all in a dazzling array of sparkles. I love these rocks with a passion. I guard them closer than I do any jewelry that I own. They mean the world to me. Not only are they beautiful, but they represent my ability to see. I held it up to the light with the rest of them. I could ever so barely see the slightest hint of a sparkle. Even though I knew it was probably gorgeous to a normal eye, it just didn't wow me. I knew it sparkled, and I was thrilled, but... I couldn't see it the way it was supposed to be. It was after my first eye surgery some seven years ago that I realized just how beautiful sparkles are. It was during the Christmas season that I stood, totally mesmerized by sparkles, in a Costco store. I held up a Barbie doll, all dressed in Holiday glitter. I could not put her down. I moved her gracefully back and forth, swaying in those "Blazer lights" as if dancing in a ballroom. My children were embarrassed by my oohs and ahhs, but that didn't matter to me. I was simply amazed that anything in this world could be quite so beautiful. It was the first time I'd seen it. Her hair was sequined, and her dress sparkled so brightly. It almost hurt my brain to take it all in! No wonder women sought tierra's for their hair, and sparkles on their dresses! It's no doubt that diamonds should be a girl's best friend! I had no clue! All these years! Oh! How I'd missed out on girly things! I was dismayed, last night as I was up all night coughing. I worried about whether or not my doctor would allow me to have surgery. I have had a nasty lingering cold for 3 weeks, now! Imagine working on my eyes and having me break out into a coughing spell! Yikes! Not what I want, nor what I want the doctor to have happen, while playing with sharp instruments by my eyes! Then, as I always do at the beginning of the week, I took my INR blood level. I am lucky enough to have a test kit, at home. This is what shows how thin my blood is, to keep my aortic valve free of blood clots. I have to take coumadin to keep my blood thin. It is a fairly risky drug, and your levels have to be frequently monitored. The surgeon wants my blood as thick as it can be for surgery, so that I don't hemorrhage in my eye, yet he wants it therapeutic enough so that it doesn't clot my valve, which could be life threatening. I was absolutely shocked and dismayed to find my INR as high as it's ever been! When it's this high, surgery is not possible. In fact, it's downright dangerous and I am ordered to stay in and rest, so that I don't hurt myself. Of all the timing! Could things possibly get worse?! I spoke to my doctor, so afraid that I wouldn't be able to go through with my scheduled surgery. Thank God, that I think we've worked it out, so that I will go. I will stop taking my medicine to thin my blood, and take my INR test daily, until Thursday. He thinks we can get it down. I sure hope so! So tomorrow, I leave for Portland, and Thursday, hopefully, I will be having my surgery to regain my sparkle sight! Yay! I'm not really "looking forward" to the surgery, but I'm so excited that it will work, and that I will soon be able to see, again. I miss my eyesight so much! As feeble and as weak as it was, it was better than it is, now! It's so true that you don't know what you have, till it's gone! So, it's upstairs to pack, now. My pajamas, my warm socks, (you have to have warm cuddly socks for surgery- it's my rule!) and all things comfortable and cozy. And inside my pocket I will carry a single very small agate that I found on Christmas Eve day on my walk with Pete. When they take those bandages off of my eyes, I am going to reach for that rock, and I am going to see it sparkle... just like Pete says it does. My eye surgery is scheduled for Dec 28th. Please join me if you like. Pray for my surgeon! I'm going to go out and expect a fish on the first cast... Just for Jim. I'm not supposed to, really, but if by any chance I'd hook something, I'd hand it over to Bill. I just need to be on the river. For Jim. I can't imagine, right now, ever drifting the N. Fork again. Without Milton? Without Jim? It would seem like a ghost river to me. Bill said that we had to, though, and I can understand that. I will go with Bill when the time is right. It sure will be difficult. Jim would want us to, though. He'd want us to remember how beautiful that river is, and why he dedicated his entire life to the good of the N.F. 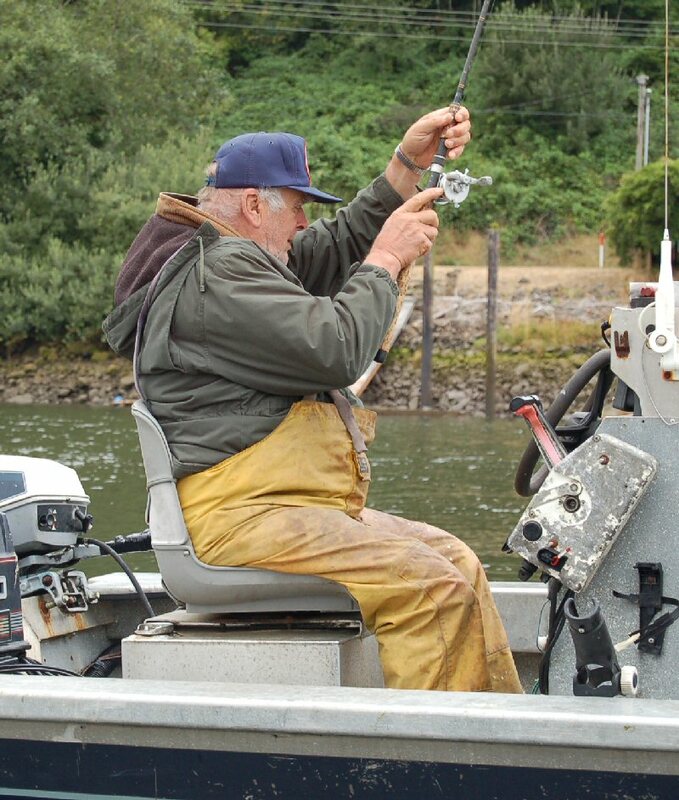 Nehalem and the fish that live there. God bless you, Jim... and God bless your family.